They also don’t know what money is. Save your tip. Photo courtesy of Marco Patella. From an udon restaurant in Japan. Well I may speak French, would that be a problem. … not at all… so don’t expect them to get your order right. If they gesture obscurely to you, you are unlucky and may go hungry! Or to the hospital!!! The others think you’re annoying. I have found “The waiter speaks Engrish” in my fortune cookie! How lucky I am ! I got a wonderful reception when I say “Baka yaro” to the non-Engrish speaking staff. Some cooks can cook edible food! If you don’t die, you are lucky! Enjoy your meal. It would be very lucky to find staffs that speak english. Most just stay in the closet until their owners decide to take them out for a hike up a steep mountain. It’s time to play our favorite game: Who Speaks English? Tell them what they win if they guess correctly, Bob. Well, Dave, they’ll win…. The food they ordered instead of something else! And remember, as a penalty, if you don’t guess correctly your server will not speak to you, and we’ll purposefully give you the wrong order while laughing in the kitchen! If they talk to you, you are lucky. If they listen, you are even luckier. If they understand, you are most fortunate, indeed ! do “speak English really mean !! What about the rest of the others? If they don’t talk to you then you should kill yourself! Some staff are helpful. The rest are staff-ups. And yet others make fun of you behind your back in Japanese. They can do all sorts of really nice things… but I wonder if they can translate the names of the dishes? Usually a wonderful source of vitamins, iron and Engrish ! We give you a great reception! We got satellite TV! If they talk to me, it is them who are lucky. Why am I lucky? Do they do beat poetry? Maybe you be lucky enough to hear waiter breathe! Enjoy meal! 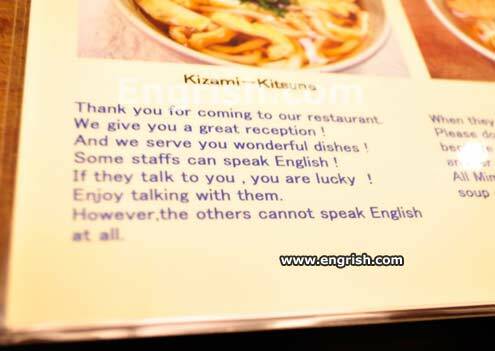 However, the others cannot speak English at all. Enjoy mocking them until they weep. es I don’t laugh at this one. It’s very funny, but it also moves me. It reflects their will to help you out.